Bluetooth Wireless Range: 20+ Ft. The Pyle P2203ABTU is the perfect solution if you are looking for a high-fidelity pre-amplifier and a power amplifier all in one. 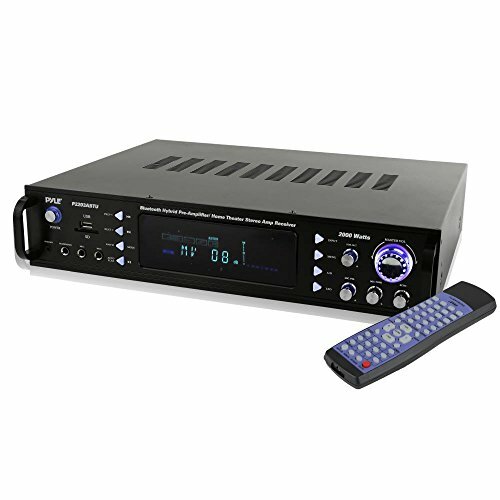 This receiver / pre-amp is equipped with Bluetooth for wireless music streaming, two sets of RCA inputs, RCA line out for recording, RCA preamp out, 2 mono RCA's for subwoofer output, iPod and MP3 player input via 3.5mm cable. Plus, a USB port for plugging in your favorite digital music in MP3 format. Features separate gain control for preamp and subwoofer channels which make it easy to fine tune the levels of your audio. The P2203ABTU produces 2000 watts peak power, with 600 watts @ 2 ohms, 460 watts @ 4 ohms, and 240 watts @ 8 ohms. Pyle has been in business for over 35 years, and their manufacturing experience and expertise is easy to see - and hear!